Dignitaries from the South China Normal University School of Music were on campus last week to sign a partnership agreement with the UCO School of Music and attend a special Cultural Exchange concert. The memorandum of understanding signed by deans from each university was the culmination of several years’ worth of negotiations in China and the U.S. The resulting agreement will provide increased international opportunities and exchanges for students and faculty at both universities. Significantly, this agreement will eventually bring undergraduate degree-seeking students to UCO from SCNU every year. Special thanks to Dr. Brian Lamb for his key efforts in facilitating the agreement and planning for this visit! I am nostalgic, but not prone to regrets. One of the few occasions where I covet a do-over occurred in 1996. At the end of that summer, Sandy competed in a biathlon and placed third in her age group. I inexplicably opted not to attend. The fact that she competed in the event at all was remarkable. In 1986, three years into our marriage, Sandy almost died in an automobile accident that resulted in numerous fractured ribs, a badly broken femur, and a nearly fatal bout with acute respiratory distress syndrome as her bruised lungs filled with fluid. The severity of the leg trauma necessitated a pair of surgeries and the insertion of a titanium rod. The aftermath affected her mobility, and eventually compelled a knee replacement. 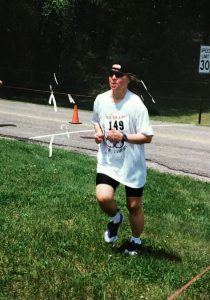 A decade after the accident, Sandy gritted her way through the pain of training, eventually biking and running her way to a biathlon completion time that would have been respectable even for an unimpaired woman in her 30’s. I am tempted to conjure a lame pretext for skipping the event, but a candid examination of the facts leads to the conclusion that I selfishly chose not to go. In retrospect, I possess no justification for ignoring what the accomplishment meant to her, and the associated physical cost. I simply needed to show up and cheer, and I failed. Fortunately, Sandy forgave my insensitivity. Hopefully, she would assign me a fairly high lifetime grade for considerateness. One of the aspects of deanship that triggers self-consciousness is the frequent praise I receive for showing up at events. In my previous life as a mud spattered, tee-shirt and jean clad ceramics teacher, there were infrequent proceedings requiring my presence. I was reasonably expected to teach, keep the kilns running, make clay, and mix glazes. Unless a major disaster ensued in the ceramic classrooms, nobody paid much attention to my whereabouts. Ceramics students, who self-referenced as “mud-rats” knew I virtually lived with them in the studio. For the sake of collegiality, I would materialize in a clean shirt for the annual faculty show, guest artist openings, BFA reviews, senior exhibitions, and graduation events, then disappear again into my world of clay and fire. When I accepted the Dean position at UCO, I consciously chose to attend as many CFAD events as possible. I trusted my presence to signify regard for the time and exertion necessary to dance, act, perform, and exhibit. I assumed that conversations with faculty and students in theaters, performance venues, and exhibition spaces would include an element of unguarded genuineness unlikely in a dean’s office setting. As an unknown Michigander, I surmised that my attendance might also help allay reasonable doubts concerning my appreciation for activities outside the realm of personal artistic expertise and reassure faculty in music, dance, theatre, and design that I valued and esteemed their contributions. A welcome side effect of systematic and purposeful attendance includes building collegiality. Trust develops when people believe they are heard, respected, and understood. Being present and actively listening is a necessity in each of those processes. Because I previously experienced virtual anonymity at arts events, I am surprised and slightly embarrassed when my simple presence triggers effusive thanks. In those situations, I am reminded of Shakespeare’s dialogue as Henry V muses on the trappings of titles on the eve of Agincourt, “his ceremonies laid by, in his nakedness he appears but a man.” When the academic ceremonies are set aside, behind the title of Dean, I remain a potter at heart. I spend a significant part of every one of the 150 events I attend each year feeling grateful for my life, and the talents faculty and students willingly share. In the final analysis, there is no greater gift than our time. The hours that CFAD faculty spend supporting their students and colleagues is humbling and remarkable. It is difficult to imagine a more service-oriented, selfless group of faculty and staff than those in our college. Thank you for being there for your students, and for each other. Steve Hansen came to UCO from Andrews University in Michigan in July, 2017. While at Andrews, Dean Hansen was Chair of the Department of Visual Art, Communication and Design and an award winning Research Professor. Although his primary area of expertise is ceramics and sculpture, he also taught courses in design, foundations and art history. An avid music and theater fan, Dean Hansen also participated in Community Theater, and spent more than a decade performing in a local rock band. As an administrator, he was instrumental in joining programs and departments from three schools into a cohesive, combined unit, developing curriculum, designing and renovating classroom and studio spaces, and serving on the Tenure and Promotion committee. As a professional artist, Dean Hansen has participated in more than 75 exhibitions nationally and internationally. His work has appeared in Ceramics Monthly, Ceramics: Art and Perception, American Craft, Southern Accents and Niche Magazine. 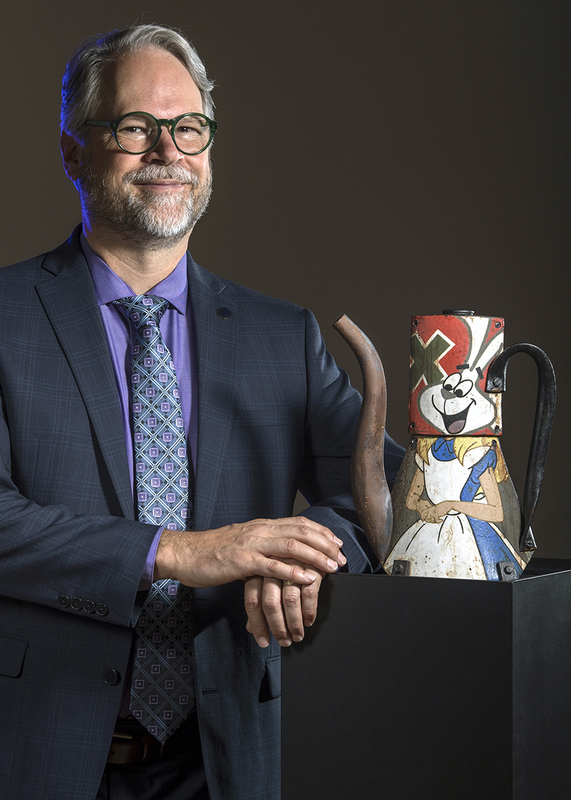 His work is also in the permanent collections of The Midwest Museum of American Art, The Fuller Craft Museum, The American Museum of Ceramic Art and the Project Art Permanent Collection of the University of Iowa Hospitals and Clinics. An avid social media user, you can follow his work on Instagram where he is “Clayprofessor”. Subscribe today to receive the latest Dean's Message posts via email!